Mesmerize your loved one with this Flame of Love Valentine Hamper and make his/her Valentine's Day very special. 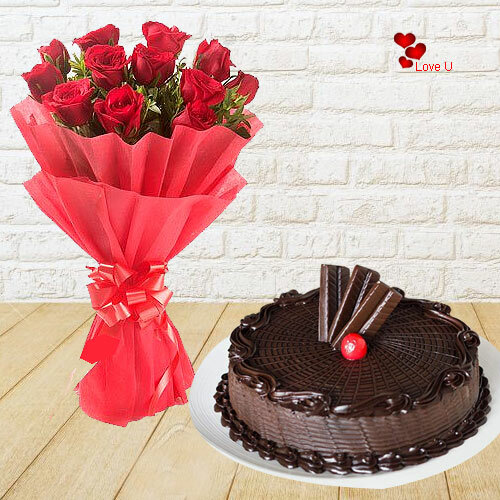 This Gift Hamper is included with a Bouquet of 10 Red Roses and a Chocolate Cake (1/2 Kg). Flowers Delivery Sawai Madhopur, Send sweets Nizamabad, Wedding Cake Rourkella, Diwali Mithai Ongole, Send Flowers and Gifts to Hubli, Online Shop Panvel, Flower to Panjim, New Year Flowers Hosur , Fresh Fruits Udipi, Send Gift Warangal, Dry Fruits to Cuttack, Birthday Delivery Bhubaneshwar, Sending to Dholpur, Flower shop Bhiwadi, Haveri Online Cake Delivery.